If you want to save money traveling from Mumbai to Delhi, you can take the train and be there overnight in as little as 16 hours. 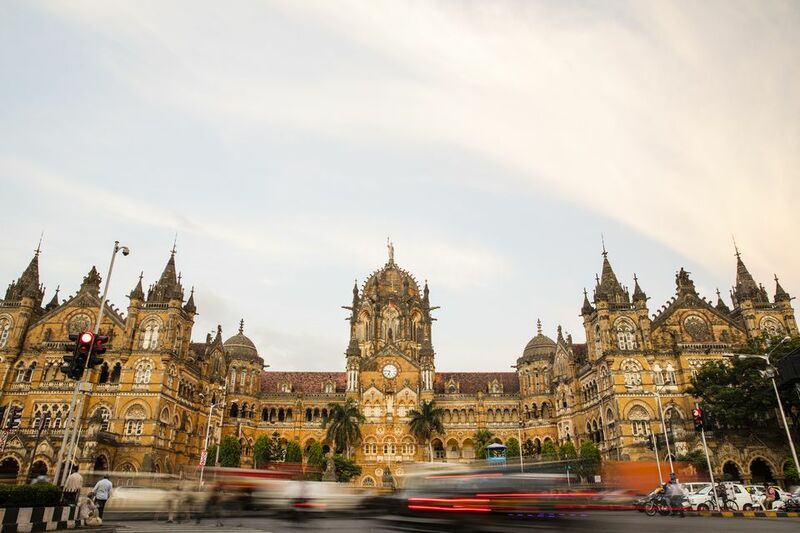 Find out about the best trains from Mumbai to Delhi here. Trains from Mumbai also arrive in Delhi at H. Nizamuddin Railway Station (NZM), which is around 20 minutes from New Delhi Railway Station. The main railway station in Mumbai is Chhatrapati Shivaji Terminus (formerly Victoria Terminus) in the Fort area of south Mumbai. Its code is CST. However, most trains to Delhi depart from Mumbai Central Railway Station (BCT) near Mahalaxmi, and Bandra Terminus in the western suburbs. Tickets under the Foreign Tourist Quota can be booked in person at CST in Mumbai, at counter 52 upstairs in the main reservation center. It's located at the side of the railway station, near the taxi rank. The 12951 Mumbai Central - New Delhi Rajdhani Express departs Mumbai Central at 5 p.m. and arrives at New Delhi Railway Station at 8.35 a.m. the next morning. There are six stops on the way. The fare in 1AC (first class, air conditioned, sleeper) is 4,760 rupees. 2A (two tier, air conditioned, sleeper) is a minimum of 2,830 rupees and a maximum of 4,073 rupees. 3A (three tier, air conditioned, sleeper) is a minimum of 2,070 rupees and a maximum of 2,753 rupees. The train runs every day, and meals are included. It's rated highly for cleanliness and punctuality. Ticket availability is good and this train has a relatively large Foreign Tourist Quota. The 12953 August Kranti Rajdhani Express from Mumbai Central to H. Nizamuddin Railway Station is another relatively fast option. It departs at 5.40 p.m. and arrives at 10.55 a.m. the next morning. There are 12 stops along the route. The fares are the same as the Mumbai Central Rajdhani train, and punctuality and cleanliness are also excellent. The train also runs every day, meals are included, and it has a Foreign Tourist Quota. The 22209 Mumbai Central - New Delhi AC Duronto Express takes the same amount of time to reach Delhi as the August Kranti Rajdhani Express (about 17 hours). This superfast train, which has only three stops, departs Mumbai Central at 11.15 p.m. and arrives in New Delhi Railway Station the next day at 4.30 p.m. The train only runs on Mondays and Fridays. The fare is the same as the Rajdhani trains. It's punctual, and cleanliness and ticket availability are good. There's a Foreign Tourist Quota too. From Bandra Terminus, the new 09003 Bandra Terminus - Hazrat Nizamuddin Rajdhani Special is the fastest option for travel from Mumbai to Delhi. The train departs Tuesdays, Thursdays and Saturdays at 4.05 p.m. and arrives at H. Nizamuddin Railway Station the next day at 6 a.m. -- just under 14 hours later. It has three stops on the way. However, the train commenced operating in mid 2017 to meet increased demand and may not run continuously throughout the year. The fare is priced higher than other standard Rajdhani trains. 1AC (first class, air conditioned, sleeper) is 5,445 rupees. 2A (two tier, air conditioned, sleeper) is a minimum of 3,230 rupees and a maximum of 4,698 rupees. 3A (three tier, air conditioned, sleeper) is a minimum of 2,300 rupees and a maximum of 3,106 rupees. Cleanliness and ticket availability are excellent, and punctuality is rated as good. Also from Bandra Terminus, a cheaper but still fast option is the 12909 Mumbai Bandra Terminus - NZM Garib Rath. Garib Rath trains are "poor chariot" trains, which have no frills three-tier air-conditioned sleepers. The trains are often quite new and in good condition, and are clean and punctual. This train departs Bandra Terminus at 4.35 p.m. and arrives at H. Nizamuddin Railway Station at 9.40 a.m. the next morning. The fare is approximately 1,000 rupees in 3A. The train only runs on Tuesdays, Thursdays, and Saturdays. Do note that it doesn't have a Foreign Tourist Quota. If you don't want to pay higher dynamically priced fares and don't mind a longer journey time, the 12925 Paschim Express Deluxe Super Fast runs daily, has 25 stops and takes about 23 hours. The train departs Bandra Terminus at 11.35 a.m. and arrives at New Delhi Railway Station at 10.40 a.m. the next morning. The fare in 1AC is 3,855 rupees. 2A is 2,250 rupees. 3A is 1,555 rupees. SL (non-air-conditioned sleeper) is 585 rupees. There's a Foreign Tourist Quota. The only drawback is that ticket availability under the General Quota is average. There are numerous other slower, less convenient trains that run from Mumbai to Delhi.